In the last decade Toronto has seen only a few master planned projects. Having no green-field development sites left within the city, opportunities for master planned communities are relatively rare and only occur when large sites can be redeveloped. 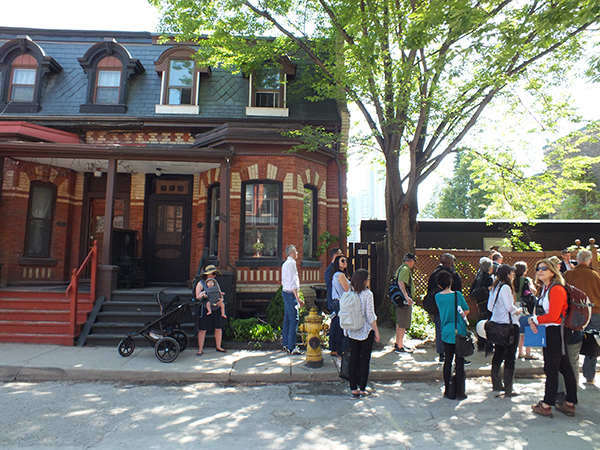 Among these few sites, three are located along a three-kilometer stretch of Spadina Avenue. 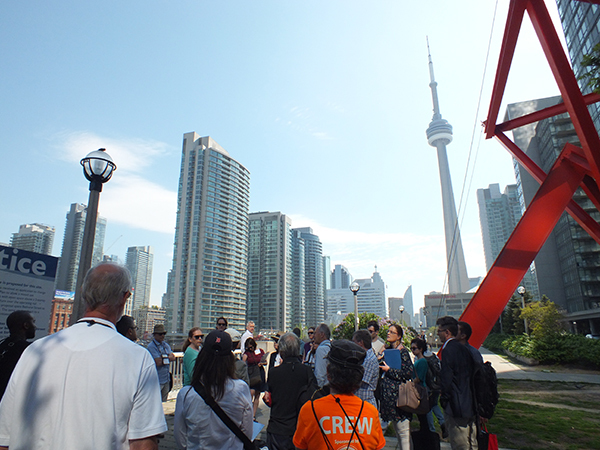 In the tour we led last Friday as part of the Ontario Association of Architects annual conference, we visited these three sites and had an opportunity to observe three master plan sites at different stages of development: City Place – completed; The Well – under construction; Alexandra Park – in design; and learn from each of their unique challenges. Each site was presented by a city planner and a developer who played key roles in envisioning and implementing the development. The project which was planned to have only between 7,000 and 8,000 units ended up having 17,000 units with both private and public tenure. Four parcels of land were dedicated to TCHC affordable housing which offers units of up to 5-bedrooms and two school sites. The construction of all the public services: a park, two schools, a library, day-care, was financed completely by the private sector. The Library which opened in 2014 is already at capacity, and the school and day-care complex which will serve 1,100 students is not meeting enrollment demand even before it opened. Lynda MacDonald recommended to always plan for more services, since they always reach capacity. The predominance of small units has created a problem for the young adults (most residents are under 35) who have put roots down in the neighbourhood but would like to move to a larger unit suitable for families. This has been a problem across much of Toronto, a situation the City is looking to start addressing with the Growing Up Study. To reduce the impact of tall buildings on Fort York Boulevard, they were located behind the first row of mid-rise buildings. One interesting design solution in City Place is related to the large Canoe Landing Park. The park ascends from the street towards the Gardiner Expressway, and this buffers the street and most of the park from the motorway. This feature was achieved by building the hill from using the soil that was excavated during the construction of the buildings, instead of removing it from the site, which also saved the developer a substantial cost. Bob Blazevski told us how the initial ideas for the site were for mostly residential uses, but they approached it differently and proposed a significant commercial component, which they saw as an opportunity for better city building. The group of developers: RioCan, Allied and Diamond Corp, approached the city with a plan with almost as much office and retail area as residential. Dan Nicholson discussed how the layout of the site, and especially the location of tall buildings, were driven by a few requirements: to limit shadows on Clarence Square Park across from Spadina Avenue, and to limit height on Spadina Avenue (because of its mid-rise character) and on Wellington Street (which is a Heritage Conservation District with a listed heritage building east to the site). This resulted in locating the tall component away from Spadina Avenue, concentrated at the south of the site. Interestingly, Stephen Job described how in order to increase the energy efficiency of the buildings, the project incorporates a geothermal system that makes use of the constant temperature below ground for heat exchange -which required digging the equivalent of ten storeys below the lowest parking levels! Overall the project has 4 tall buildings and 7 overall, between 38 and 45 storeys, and three condo and three rental buildings. Beside retail facing Wellington Street, there will be a large retail component centered on a pedestrian plaza. A major concern of the Design Review Panel was how this plaza will be visible and accessible to the public and part of the public realm that was addressed by multiple north- south connections. The TCHC townhouse complex built in the mid 1960’s in Alexandra Park by architects Jerome Markson and Henry Sears was considered innovative and was highly regarded at the time. However, with its elimination of traditional street pattern and the undefined open spaces, it has not aged well. After it was decided to address the existing issues in the complex, monthly meetings were conducted since 2009 with the working group created by TCHC to define and refine the work explained Joyce Ho. The group came up with ten principles, three of which were discussed in the tour. 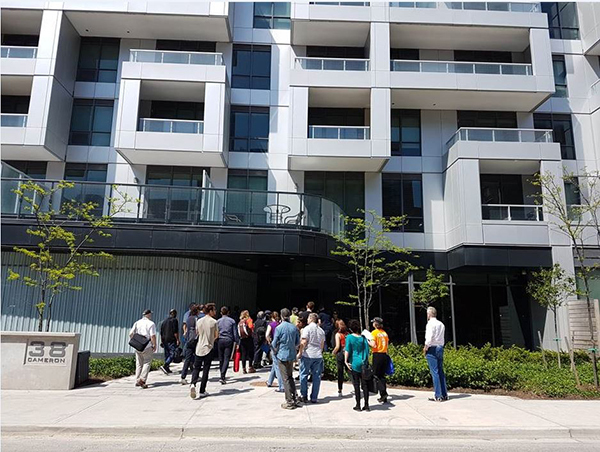 The first principle was Zero Displacement: unlike in similar projects such as Regent Park, none of the tenants were required to move to TCHC housing in other parts of the city during the works. Paul Cope told us how this has led to complex phasing and schedule as the new construction must be completed to existing tenants before demolition of the next buildings can start. The second principle was the City’s rental replacement policy of “Like to Like”: rental units that are removed from the market have to be replaced with similar types, explained Graig Uens. This resulted in a high proportion of townhomes in the redevelopment, which is very unusual in new development in central Toronto. The third principle, the market buildings and affordable building were to be intertwined to achieve social cohesion and to prevent a separation of “us” vs. “them”. The tallest building in Alexandra Park will be a 21-storey tall element, but otherwise the development is predominantly midrise. Many mid-rise buildings in Toronto (especially on infill sites) have very deep floor plates of 20 m or more to maximize density on their limited sites. Here, the developers found that the deep floor plates created a lot of wasted space, and the mid-rise buildings depths were limited to between 16 and 18 m.
Phase 1 consisted of SQ (condos market) and new townhomes. For Phase 2, which includes 806 TCHC units, an Official Plan and Zoning By-Law amendments were submitted earlier this year, while the planning framework was adopted back in 2013.